The Vatican Secret Archives have fuelled people’s imagination for centuries. This is largely due to its incomparable long and interesting history. 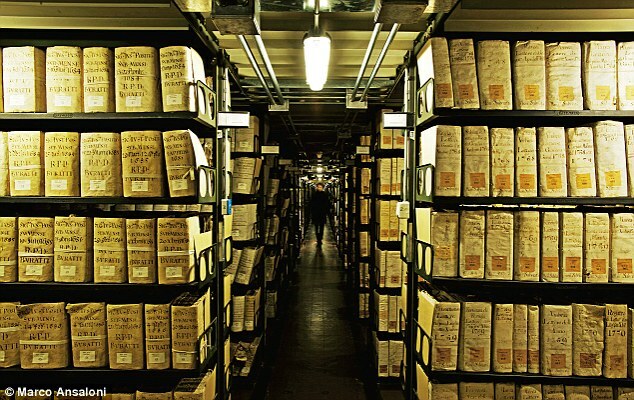 Today, the entire documentation kept in the Vatican Secret Archives occupies 85 kilometres of bookshelves and is constantly growing. It covers a continued chronological space of over 800 years. Moreover, its unique location, the majestic documentary treasures and the limited access contribute to this aura of mystery. The shroud of secrecy that has always surrounded this important cultural institution of the Holy See, due to the allusions to inaccessible secrets, as well as to the publicity it has always enjoyed in literature and in the media, makes this publication even more attractive. And now, for the first time, a publisher was allowed to walk around this wonderful location without any restrictions. The result is a magnificent book with impressive and atmospheric illustrations. Take an unforgettable walk past the most exceptional places and documents in these secret archives, including reading rooms that are only open to academia, as well as rooms that remain closed to the public, some of which are decorated with gorgeous 16th and 17th century frescos, while others accommodate several thousands of documents. You will be able to discover more than 100 of these documents in this book. Specialists of the Vatican Secret Archives have selected these documents and provided each one with a precise explanation. It is a careful selection of documents that show the richness of the Vatican Archives’ contents. A highly appealing, unique and attractive book, for the layman as well as for the academic!